If you are planning an appointment at the Vein Healthcare Center for Sclerotherapy, it is important to be informed about pre-operative guidelines. Being fully prepared for your appointment and following recommendations for care before your appointment will help ensure successful, comfortable treatment. Sclerotherapy is an outpatient procedure for treatment of small veins just below the skin's surface. A small needle provides access to the targeted vein allowing the injection of a detergent-like substance, called a sclerosing agent, into the vein's interior wall. The vein wall is irritated, becomes sticky, and seals shut, allowing it to disappear, and for blood to be diverted to other healthy veins in the leg. An appointment for Sclerotherapy can take between 15 minutes to 1 hour, depending on the size of the vein, and is usually conducted over the course of 3 to 6 sessions. These sessions occur over a period of 6 to 8 weeks. 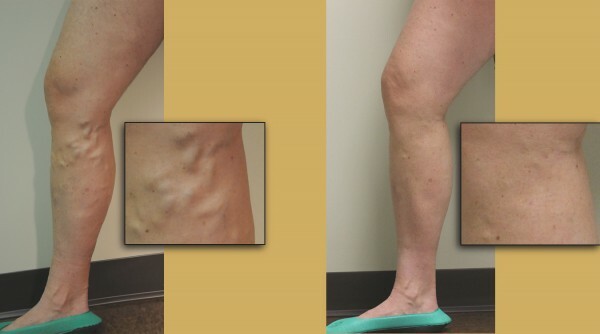 The resolution of all targeted veins involved in the procedure may take several months. The sclerosing agent is virtually painless upon injection. Sclerotherapy is a well-tolerated procedure, and in most cases, activity can be resumed immediately following your appointment. At the Vein Healthcare Center, we use sclerosing agents that comply with the most up-to-date standards. They are considered extremely safe and hypoallergenic. While allergic reactions are uncommon, patients should be aware of any irritation or pain at the injection site that occurs post-treatment. If such a reaction occurs, call the Vein Healthcare Center immediately. Take any regular medications the day of the procedure. There are no pre-operative medications required for Sclerotherapy. Fasting is not required; eat a normal breakfast or lunch. Bring an iPod or headset if you'd like to listen to music during the procedure. Compression stockings should be purchased prior to your appointment and brought with you the day of the procedure. They will be used immediately following treatment, and during the following 1-2 weeks. Trying your compression stockings on prior to your visit will ensure that they fit comfortably. Inform the Vein Healthcare Center of any allergies to antibiotics or steroids. Once you arrive for your appointment at the Vein Healthcare Center, you will change into exam shorts and photos of your leg will be taken. Photos are used only for your personal medical chart. Your leg will be rechecked using Ultrasound, and your doctor will write on your leg with a magic marker. Your vital signs will be checked, and you'll be asked to relax on the table. There are pillows and blankets available for your comfort, and if you brought a listening device, you can begin listening to music. You will feel a pinch of local anesthesia at this time. A sclerosing solution is then injected through a very fine needle directly into the vein. This process is usually painless, though some patients may experience some mild discomfort. The number of injections during each procedure varies depending on the size and location of the vein, and the process can last from 15 minutes to 1 hour. You will be asked to put on your compression stocking immediately following the procedure. If you have any questions or concerns about your Sclerotherapy appointment, call our office at 207-221-7799. Your care and comfort is our number one priority.